Hughes Air Heating & Cooling takes great pride in being your Mesa-area Trane Comfort Specialist. 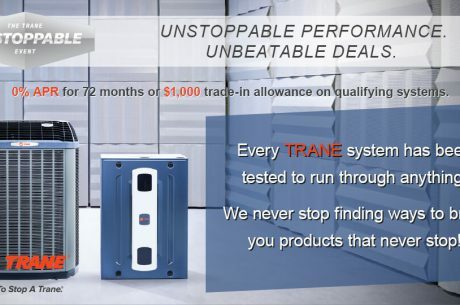 For more than 100 years, Trane has been a name synonymous with trusted, high-performance heating and cooling products. That goes to show the level of commitment our Trane HVAC team puts toward quality workmanship and exceptional service for your local home or business. And any other Trane comfort system needs! After 30 years of industry experience, we’re comfortable recommending Trane HVAC products to our residential and commercial customers. While we’re qualified to service pretty much any make or model of heating and cooling machinery, we only sell and install HVAC systems manufactured by Trane. We’re glad to align ourselves with this brand known for innovative design, quality construction, and solid longevity. We make it a top priority to match you with the Trane AC or heating options that best serve your needs. Plus, we’re here to support those Trane HVAC systems for years to come. With any type of heating and cooling installation, it’s vital to depend on competent HVAC pros that will stand behind their workmanship with secure warranties. That’s another way we provide assurance for Trane HVAC services at Hughes Air Heating & Cooling. Come to us for your Trane gas furnace or Trane AC units, and we’ll back up our expert installs with warranty coverage good for the first year. Furthermore, become one of our maintenance contract customers, and enjoy that one-year warranty protection on all of your Trane HVAC services for repairs as well as installs. Like the slogan says, “It’s hard to stop a Trane,” particularly when it’s rigorously maintained by the Trane Comfort Specialists at Hughes Air Heating & Cooling. Call us today to learn more about our Trane HVAC services in Mesa, Scottsdale, and Chandler. We’re here to help! Interested in the XV product line from Trane for optimal performance and energy ratings? We have it for you at Hughes Air Heating & Cooling. These Trane heating and cooling units are an ideal addition to any home or commercial comfort system. Get in touch with our award-winning installers now.